Prolink is proud to announce release of QC-CALC 3.3. The following are just two of the new features in new QC-CALC 3.3. 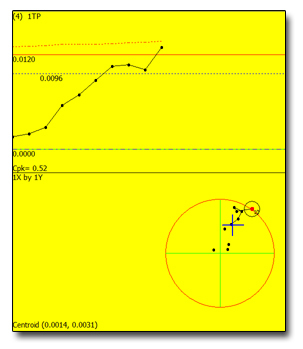 True Position Charting - The new True Position Plot (pictured at right) automatically calculates the bonus and MMC tolerance. In addition, we calculate Cpk based on the moving bonus tolerance. MultiSource QCC files - QC-CALC 3.3 can now seamlessly integrate multiple data collection sources into the same QCC file. This means you can measure your parts on multiple devices and merge the data automatically. Download the latest version of QC-CALC on our website at http://www.prolinksoftware.com. The ability for QC-CALC to calculate your limits has been built-in for years. 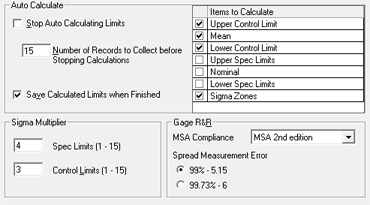 Normally customers use this functionality to calculate the mean, control limits, and sigma zones. However, we can also reverse calculate your nominal and spec limits based on the data you've collected. We speak with customers all the time who receive tight limits from engineering and are then told to achieve a Cpk of 1.33 when the process cannot necessarily perform to such levels. While this doesn't sound very SPC-like, there are certain cases where it isn't that the process that needs improvement. It's the limits that need loosening. We won't assist you in your arguments with Engineering, but we will tell you what your spec limits would need to be if you want to hold a Cpk of 1.33. In QC-CALC Real-Time 3.0 or up, go to Tools > Options > Statistical Settings. In the area named Auto Calculate, choose which limits you want us to calculate by checking the options. Specify the Sigma Multiplier just below to the left. For a Cpk of 1.33, use 4 as the Spec Limits sigma value. Choose Tools > Calculate Limits. The limits you specified will automatically be calculated according to the settings. PLEASE NOTE: Your new limits are for on-screen purposes only and will not be saved permanently to the QCC file until you choose Tools > Save Calculated Limits. To go back to your current limits, perform step 5 again to turn off the calculated limits. Download the latest version of QC-CALC Real-Time.